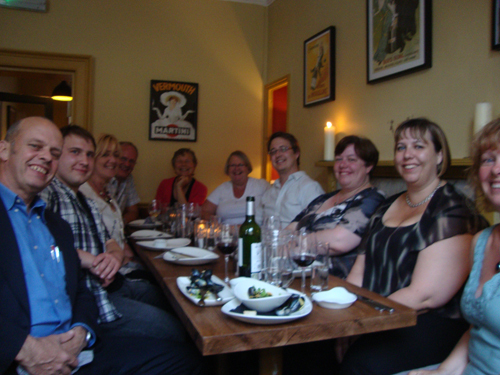 We have quite a few members in Bath, Bristol, Somerset, Devon and Dorset. Some months ago during some banter on Twitter, it was suggested by this coterie that we hold an event in the South West. And so we did. Last Thursday. And what a wonderful day out it was. 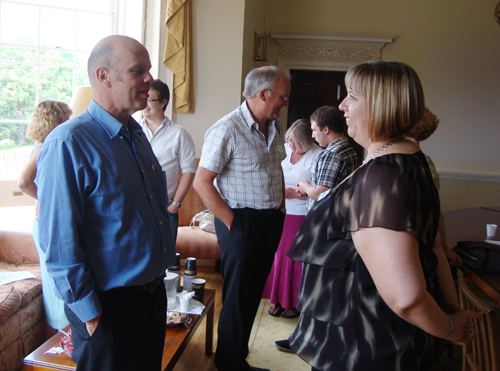 The whole shindig was organised and hosted by our members who work at Bath Spa University, that is to say Elaine Chalus, Bobby Anderson and Tracey Hill. 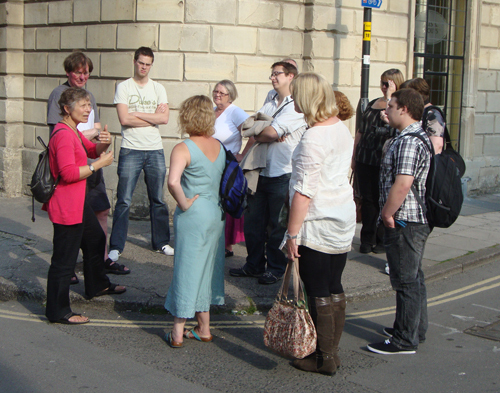 The format was informal round-table chit-chat, a lecture, a walking tour of Bath and dinner. Interspersed with tea, coffee and bickies. 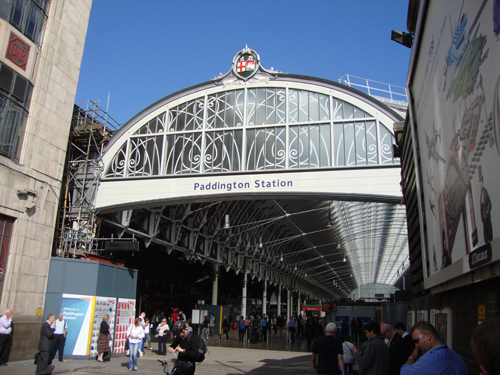 I stand to be corrected, but apart from me missing my train from Paddington, the whole day went without a hitch. 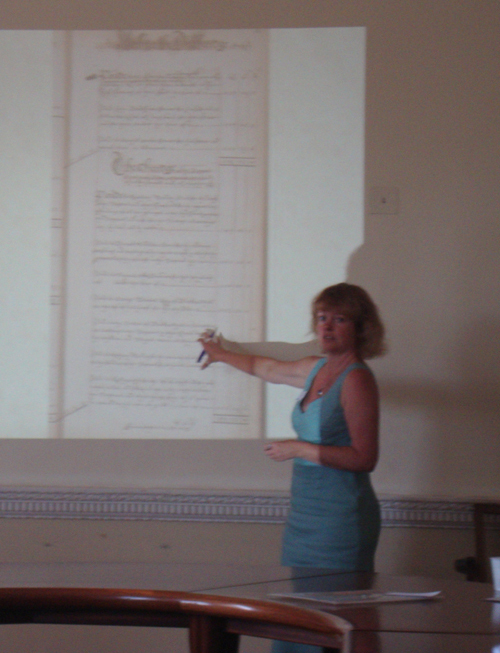 Dr Tracey Hill* gave a fascinating talk on the Lord Mayor’s Show of 1613, which was organised that year by the Honourable Company of Grocers. So although we were in Bath, the event had an essential London history ingredient. 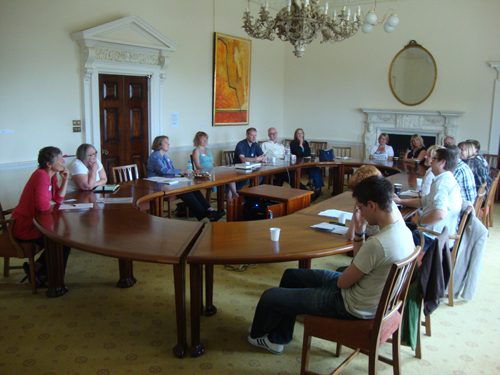 Our round-table and lecture were held in a wonderful bright, friendly room of the Main House in the university’s picturesque Newton Park complex. Perfect for the occasion. 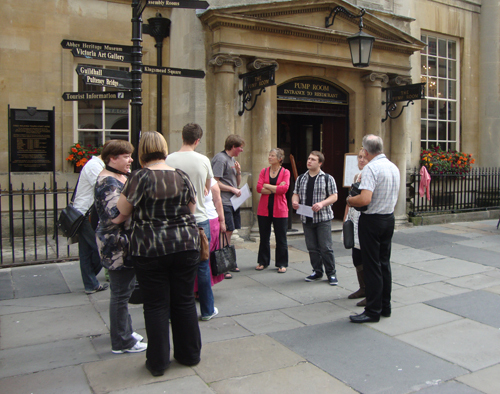 We then had an approximately 90 minute guided walk of Bath, exploring the city from its Roman origins through the medieval period and ending up at John Wood the Younger’s 1760s Royal Crescent. Much historical detail: our hosts’ local knowledge was staggering. Having not visited Bath for some 20 years, for me it was a thoroughly absorbing education. At the end of all this, we had an excellent dinner at a new bistro opened by the proprietors of specialist wine merchants The Tasting Room. Excellent fare, and much wine and beer (speaking for myself) consumed. For me, this event epitomised what London Historians is all about: members’ hands-on involvement and collaboration, coming together to share knowledge and friendship. I’d like to thank all our members and guests who supported the day and in particular the wonderful above-named academics from Bath Spa University who made us feel absolutely at home and who put together a perfect programme and gave us all a day to remember. 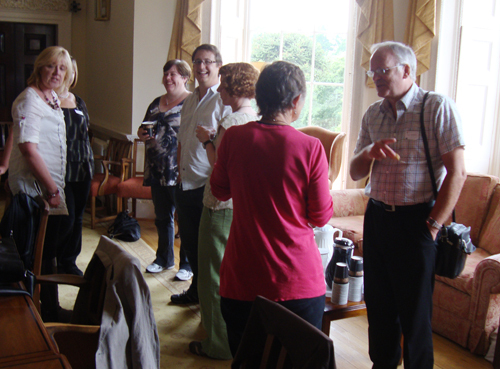 Flushed with the success of this day, we informally discussed another London Historians South West event, probably in the Autumn, probably in Bristol. Watch this space! *Pageantry and Power: A Cultural History of the Early Modern Lord Mayor’s Show, 1585-1639, by Tracey Hill. Tracey Hill's excellent illustrated talk and not-so-excellent photo by the author. The walk kicks off at the Pump Room. 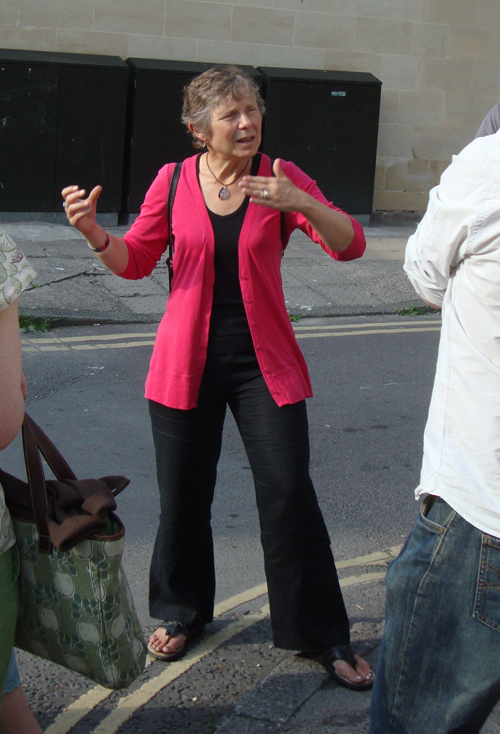 Elaine Chalus shares her astonishing knowledge of historical Bath. The Cartoon Museum has mounted some extraordinary exhibitions over the past year, that’s for sure. We’ve had wonderful shows celebrating Fougasse (Kenneth Bird) and Ronald Searle. More recently, I only just managed to make it to the Steve Bell retrospective before it finished: it was a pure delight. And now we celebrate the artists and writers who have given us Dr Who comics over the past 45 years. 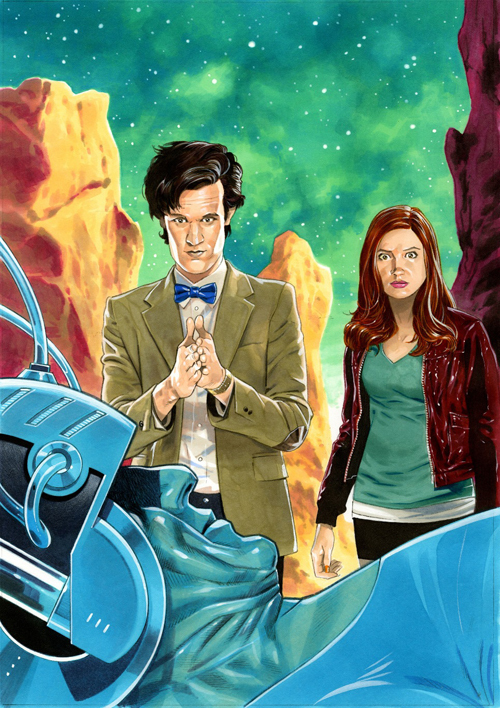 This is the first ever exhibition of Doctor Who comic pages with over 100 works from all periods featuring the Doctor in all his incarnations. It includes artwork by Dave Gibbons, Dave Lloyd, John Ridgway, Frank Bellamy, Martin Geraghty, Lee Sullivan and many who are unidentified. As you enter the show, the centrepiece is a wonderful montage of all the Doctors by Lee Sullivan, done in an identification parade style line up. Like most people under the age of about 55, Dr Who was part of my childhood. I remember the first ever William Hartnell episode. Unlike some of my good friends, I am not an aficianado. Dr Who and I parted ways when we stopped getting British TV programmes under sanctions against Rhodesia from the mid-1960s. Nor am I a cartoon geek in the way of comic book collectors, the regular habitués of Hidden Planet and the like. But I adore comic art. The current excellent TV series British Masters mourned the death of Lucien Freud (rather hastily edited in! ), suggesting that David Hockney was the only surviving exponent of the 20th Century tradition of great British figurative art, and posed the question who will take the baton? The answer, in my view, is our comic artists and they don’t need to take the baton because they have been carrying it all along. The “problem” is that the only people who appreciate this fact are comic fans. And if you have doubts about the calibre of comic book illustrators as artists, you need only to visit this show. I readily admit that my expectations were not especially high. 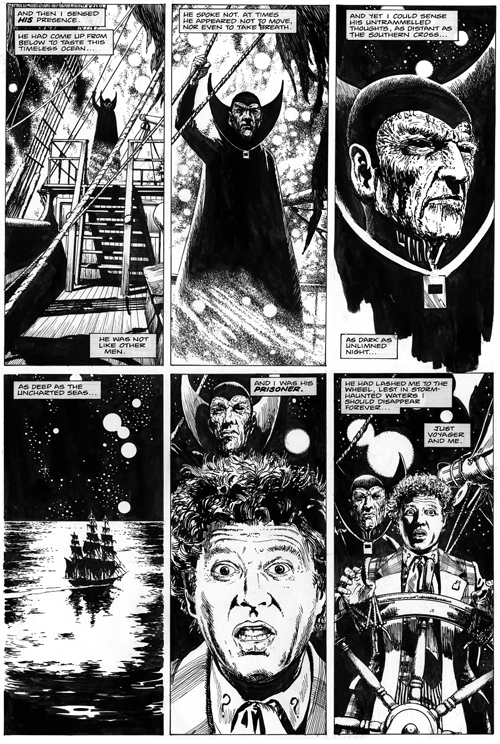 I had thought that the works would be of the middle-ranking type, the BBC churning out Dr Who comics as part of the whole Dr Who package. Not a bit of it. These works are of the highest quality – lovingly and painstakingly created. Not only that, as the exhibition points out, in the dark years of the 80s and 90s when no Dr Who programmes were made, it was these illustrators and their writers who kept the flame alive. 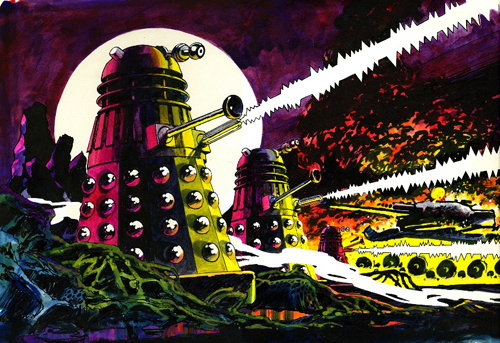 Genesis of the Daleks, Artist unknown, Doctor Who and the Daleks Omnibus 1976. Doctor Who material © BBC tv © Panini UK. Voyager, John Ridgwary, Doctor Who Monthly, July 1984. Doctor Who material © BBC tv © Panini UK. Umwelts for Hire, Martin Geraghty, The Brilliant Book of Doctor Who 2011. Doctor Who material © BBC tv © Panini UK. There are over 100 images on display in this show. The Cartoon Museum are to be congratulated for assembling such a rich and diverse collection from mainly private collectors around the globe. 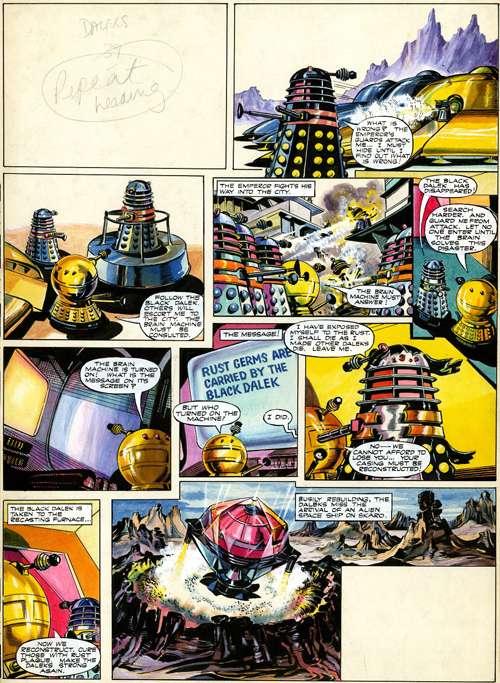 Dr Who in Comics 1964 – 2011 runs until 30 October. Entry is £5.50, concessions apply. Free to Art Fund members; £1 discount to London Historians members. Highly recommended. Yesterday, English Heritage announced that 16 Underground stations have been given Grade II listing and a further three exiting Grade II stations have been upgraded to Grade II*. The 16 are: Aldwych, Belsize Park, Brent Cross, Caledonian Road, Chalk Farm, Chesham, Covent Garden, Hendon Central, Oxford Circus (counts as two), Perivale, Redbridge, Russell Square, St John’s Wood, West Acton, and Wood Green. The three upgraded ones – all by Charles Holden – are: Arnos Grove, Oakwood, and Sudbury Town. I am not familiar with all of these stations. But while questioning Perivale’s credentials, I am pleased that Russell Square is included, partially for personal reasons. For in the last year of my degree, we attended a weekly tutorials on 15th Century Florentine Politics at rooms in nearby Bedford Square. 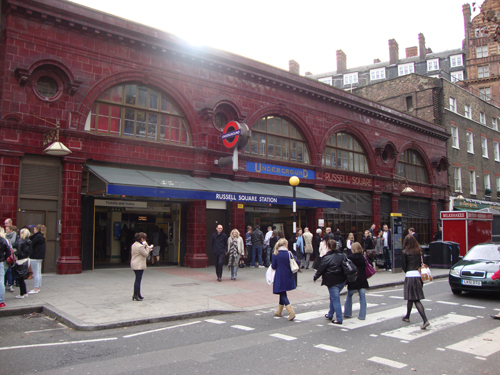 It is a station whose wide frontage belies its small size. It is one of the deep tubes which, like Covent Garden, has no escalators, relying instead on three antiquated lifts or, if you’re mad enough, a 175-step spiral stairwell. Russell Square is also the nearest station to one of my favourite London institutions, the wonderful Foundling Museum. 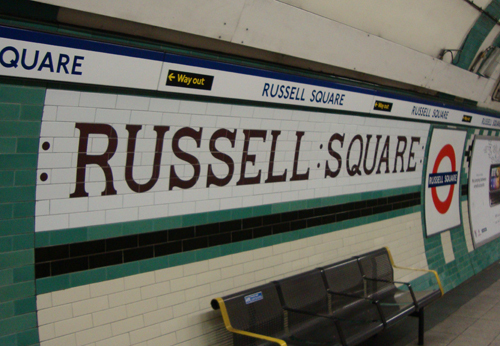 Russell Square station is from the second generation of Underground construction in the early 1900s which added deep tunnel lines thanks to the new tunnelling technology of South African engineer James Greathead (1844 – 1896). The first generation tube system from forty years previous had had to rely on the cut and cover method, basically train lines in a covered ditch. It is also one designed by the architect Leslie Green, a Londoner, overshadowed in history by the great Charles Holden. 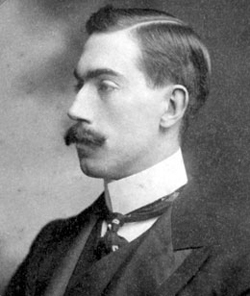 One of the reasons for Green’s relative obscurity is perhaps the fact that he died of tuberculosis in 1908 at the tragically young age of 33, having been made a fellow of RIBA the previous year in the wake of his greatest achievement. He was responsible for the designs of no fewer than 28 Underground stations on what are today the Piccadilly, Bakerloo and Northern Lines, placing him very much in the pantheon with Holden when it comes to station design. 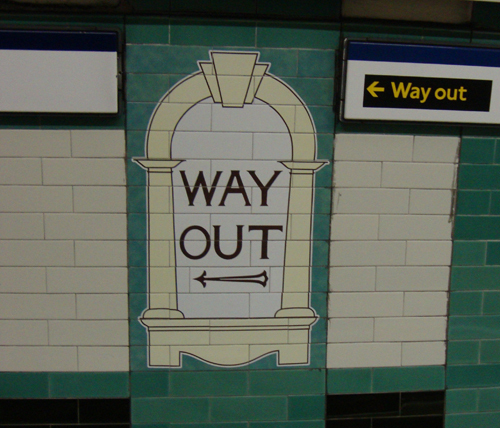 Green’s Arts and Crafts influenced stations are characterised by the distinctive “ox-blood” glazed tiling which adorn their street frontages. His platform decorations incorporated a variety of geometric patterns with the station names writ large in pleasing, pre-Johnston typefaces. A great deal of his interiors were lost over the years during various renovations and upgrades, but in recent years much has been sympathetically restored by London Transport. There is a good list of Leslie Green’s stations on Wikipedia, here. What is your favourite of the newly-listed stations? Today being the anniversary of the death of Henry Mayhew in 1887, it is appropriate to feature some more excellent early 20th Century cartoons from Punch, which Mayhew co-founded in 1841. As featured in Mr Punch In London Town from the New Punch Library. 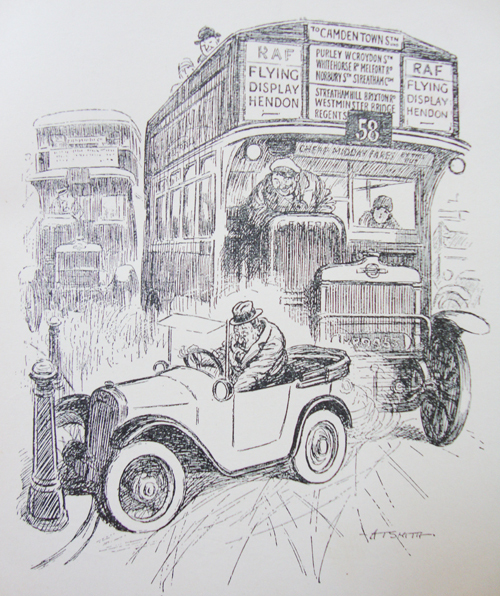 These artists were phenomenally talented, I love in particular their drawings of vehicles. WELFARE WORKER: "Do you mean to tell me that this child was dropped on to the floor?" 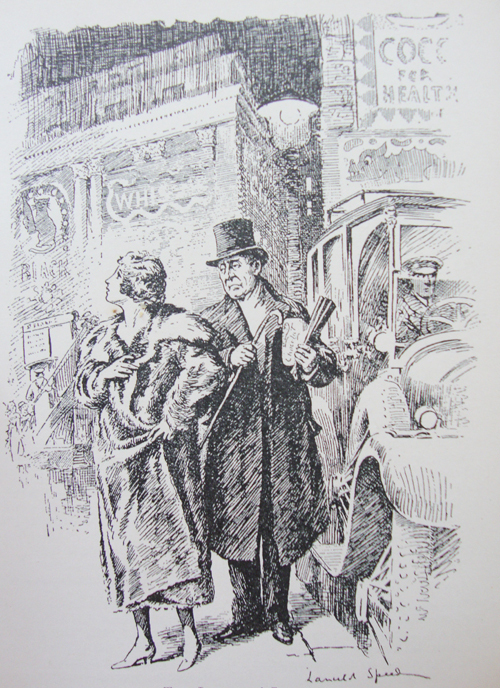 WORKMAN: "That's all right, lady. All my kids bounces." by Charles Grave. THE LIGHTS O' LONDON. UNCLE (to niece up from the country, absorbed in electric advertisements). 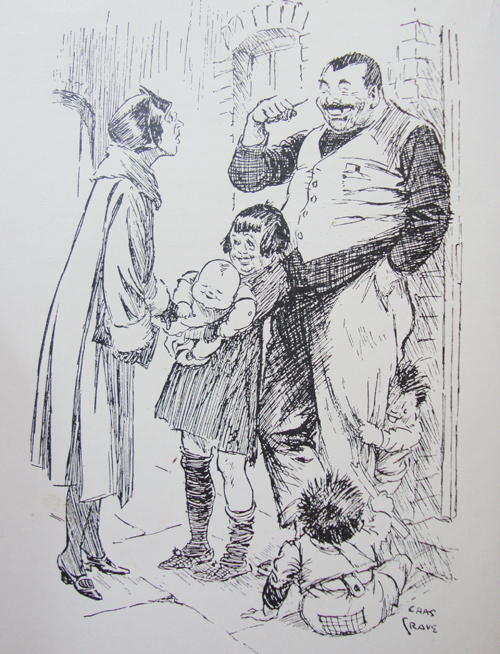 "Come on, my dear, don't look at those confounded things - it only encourages them." By Lancelot Speed. This, presumably, is a reference to Coverdale’s Great Bible, ordered by Henry VIII and supervised by Thomas Cromwell. 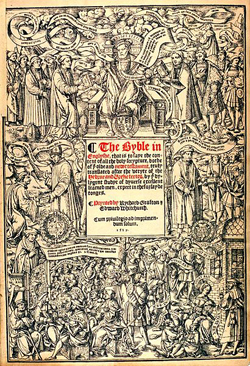 It borrowed the approved bits and edited the unapproved ones from Tyndale (who had recently been burned for heresy on the Continent), added new translations directly from the Vulgate and published this patchwork edition in 1539, the French having thwarted an attempt to print it in Paris. 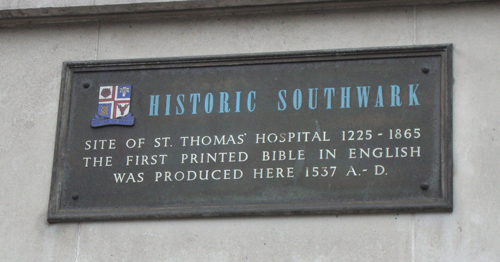 But the good people of Southwark have the date as 1537. The original quote goes ‘imprinted in Southwarke in Saint Thomas Hospitale by James Nycolson, 1537’, but I cannot find the primary source for this. Was it 1537 or 1539? Please comment if you know something, thanks. 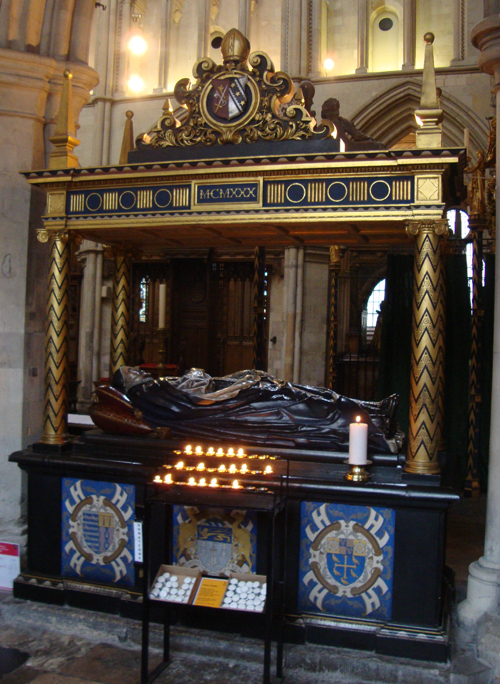 We stroll a few hundred yards and eighty years in time into Southwark Cathedral and contemplate the tomb of Lancelot Andrewes. If you followed the 400 anniversary coverage of the King James Bible a few months ago, his name should ring a bell. You will recall that the Authorised Version – as it is more correctly known – was compiled by committees of scholars based in London, Oxford and Cambridge. It is a wonder, really, that it turned out so well. Andrewes was the leading theologian of his day. 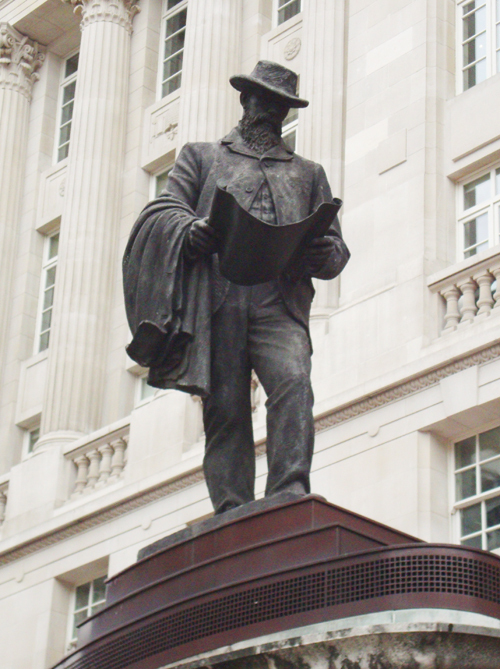 He was a member of one of the Westminster groups and considered to be the leader, or general editor, of the project. The work began in 1604 and the book was published in 1611. Andrewes served variously under Elizabeth I and James I as bishop of Chichester, Ely and Winchester (hence his attachment to Southwark). He died at Winchester Palace in Southwark in 1626 and his fame and influence as an academic theologian have endured down the centuries with much of his writings and many of his sermons being published over the years. He also devised the annual celebration of the king’s safe delivery from the Gunpowder Plot which – much transmogrified – we still mark every 5th November.